Given to me by one of my friends and fellow writers, the book Interpreter of Maladies was, hands down, one of the best gifts I got during the holiday season. After reading the debut collection of short stories by author Jhumpa Lahiri, there’s no question in my mind that it is well-deserving of the prestigious awards it’s won (the Pulitzer Prize and the PEN/Hemingway Award among them). I can‘t recall if I started reading the book the same night that I got it. I do know that once I opened the cover and delved in, I was hooked. Many late nights in a row, like a parent to a insistent child, I promised myself “just one more story” before going to sleep. Lahiri has one of the qualities that I envy as a writer; the ability to make each of her short stories so unique and able to stand alone that I never felt as if one was simply a continuation of the previous, even though there is a common theme of Indian nationality throughout the book. The voice of the storyteller also shifts effortlessly amongst stories. In the first of the volume, “A Temporary Matter“, the narration is modern and intimate; the reader is privy to the point of view of a husband as he and his wife come to the realization that their marriage has slowly disintegrated, intensified after they suffer a deep personal loss. Further on in the book, “A Real Durwan” takes on a old world, folktale-like feeling, following a talkative older woman who spins some colorful yarns of her own. Each piece of prose in the book is filled with rich conversation, imperfect (and thoroughly realistic) characters and minute details that add lushness to the settings and action of the stories. To temper my envy of her superb storytelling, Lahiri has admitted to one of the truths of many great stories: they take time, and sometimes struggle, to craft. 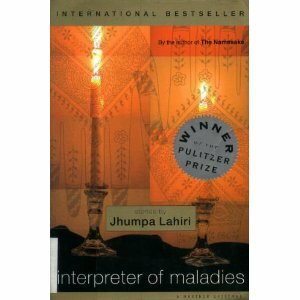 In an interview with NPR, she explains that Interpreter of Maladies began after she spoke to an acquaintance about his job and the title popped into her head: “I felt a need to write this little phrase down, because I thought…it might make a nice title someday; I would look at it from time to time and try to write something, and I just, I really had no idea until about five years later, when the idea for the story came to me…” She further explains that material for some of the other stories came from bits of her own experiences growing up amongst two cultures. After enjoying this book so much, I’m on the hunt for Lahiri’s novel, The Namesake, and her second collection of short stories, Unaccustomed Earth. Even if the other two are as good as the first, her debut is in no danger of being tossed into a yard sale or donation box though; it will definitely remain a favorite of mine, added to the stack by my bedside or nestled in a bookshelf. I’m so glad that Ms. Lahiri’s characters still have more stories to tell.